Whenever I’m in a tall building I worry about how I will get out in case of an emergency. I’m sure I’m not alone in this particular thought exercise. 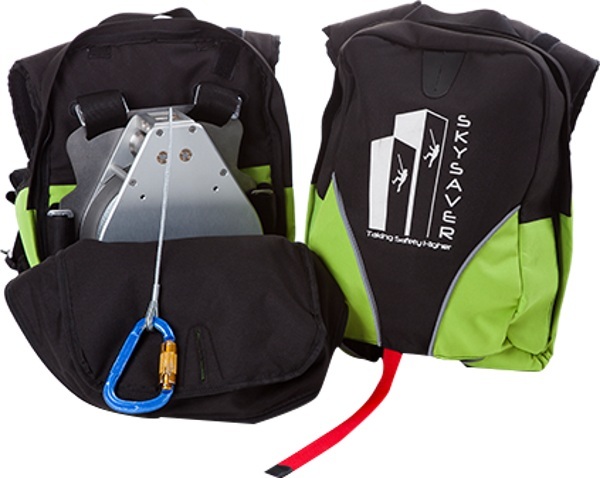 The SkySaver is the back pack that was made to save your life in case of a high-rise emergency. Basically, this backpack has cord in it allowing you to hook onto the window sill and slowly drop down the side of the building to safety on the ground. There appears to be no major skill needed (you don’t have to be a mountain climber to use this) and it’s fairly easy to hook up. The line attaches to a preinstalled hook on the window. Strap into the five-point harness and out the window you go to safety. The line is made from durable, strong materials but it can only handle up to 260 pounds. Still, this might be a solid safety measure for those that live in tall buildings. Contact local dealers for prices.